I recently found myself staying a week in the Palm Springs area during the 100-degree end-of-spring heat. I discovered very quickly that my body is no longer tolerant to the dry torrid sun that beats down on everything with a relentless whip, rendering even an iron man completely jellied into oblivion. The only way to survive is to stay cooped up behind drawn blinds in an air-conditioned tomb somewhere. That, or lounge in a pool for 24 hours, only stepping out to refill the margarita glass or duck into a room full of whipping fans to sleep away the day. Driving in a car is impossible when the steering wheel is hot as a frying pan. And any form of social interaction is shelved until August because the smart restaurateurs and shop owners simply close. Those who have money flee town and those who don’t learn to adjust their schedules, only venturing out past sundown when the temps creep under a breathable 80-90. But the promise of a good meal at the end of my self-imposed exile in a locked home had me creeping from the darkness at 4 p.m. on a Saturday to visit one of my surrogate families. And when, high above the East Valley while dangling my feet in an infinity pool overlooking the glorious tawny tumbleweed and smoketree strewn landscape, my friend Gloria asked me if I liked rack of lamb, I realized there are some things you risk dehydration for – like good friends who love you and your favorite piece of meat. I have never had anyone cook rack of lamb for me before, nor have I tried to myself. I am not sure why it is such an intimidating thought but I’ve always seemed to view the dish as something luxuriant to order at restaurants. But contrary to my outdated belief, I learned that grilling lamb is as simple as other meats and the results are mouthwatering. I am going to put this on my dinner list to make the Cute Gardener this summer, minus the 100-degree heat wave of course. Rub the rack with a little olive oil, the herbes de Provence, garlic and salt and pepper. Put in the fridge to marinate for a few hours with the rosemary sprigs laid on top of it. Heat a grill to moderate to hot-hot heat. When the coals are ready, place the rack of lamb on for six minutes on one side and then flip and cook the other side for about 15 minutes more. This creates a medium well rack, soft and juicy with not much pink. If you like yours pinker or more well done, adjust. This one was served to me with cranberry sauce. Very different from mint jelly or the usual accoutrements but very good –it may be my new favorite lamb condiment. We also had grilled peaches and chocolate brownies for dessert. And of course, don’t forget the bottles of good red wine. 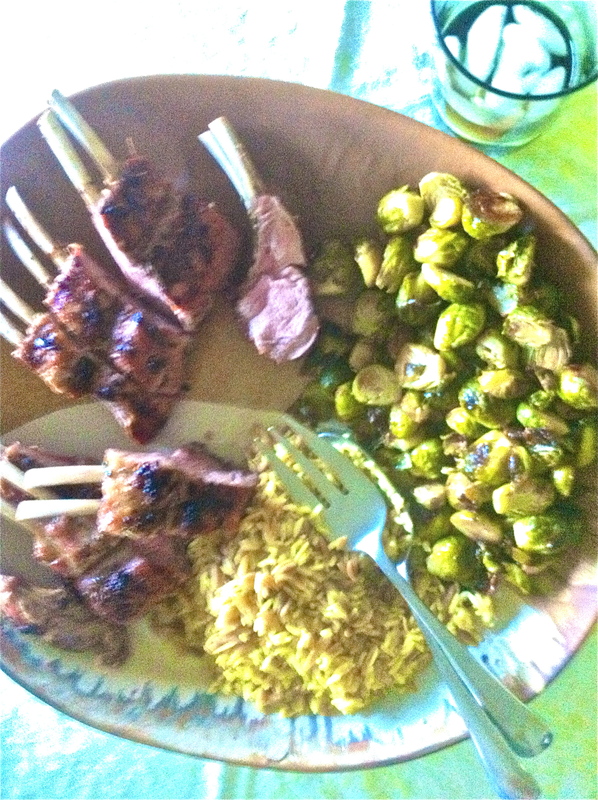 This entry was posted in Art of Cooking, Through The Stomach and tagged Cute Gardener, grilled lamb, Kimberly Nichols, rack of lamb recipe, Unorthodox Foodie by unorthodoxfoodie. Bookmark the permalink. O! How the mighty ex-desert rats have fallen… myself included. When I think how many times I would gladly have sold my soul for one whisper of a cool ocean breeze. And now, in LA, we have only to throw open a door or window – that is, if we ever closed them. Nice rack, by the way. Even as a current desert rat I struggle with the heat. Perhaps one day Sous Chef will listen to my pleads to relocate. Until then, I’m just a pool and margarita away.